WASHINGTON, D.C. -- As their country reels from a campaign of bombings and kidnappings blamed on the Islamist militant group Boko Haram, nearly all Nigerians (95%) say the group presents a "major threat" to their country's future, while 3% say a "minor threat." Significantly fewer Nigerians consider militants in the Niger Delta a major (34%) or minor threat (37%). Though the Boko Haram insurgency has flared for more than five years, the Nigerian government has been criticized in recent months for its continued failure to halt attacks in the country's northeast and its perceived indifference to the 276 girls kidnapped from their school in Chibok this past April. While the kidnapping and resulting international media coverage placed tremendous pressure on the government to act, the majority of Nigerians are not impressed with their government's efforts to combat terrorism. Two in three Nigerians (67%) say their government is not doing enough to fight terrorism, while 26% say that it is. The perceived potency of the Boko Haram threat contrasts sharply with Nigerians' growing lack of faith in their own security services and leadership. Although the majority of Nigerians are confident in their military (57%) in 2014, this is down 11 percentage points from 2013, and 21 points lower than in 2011. 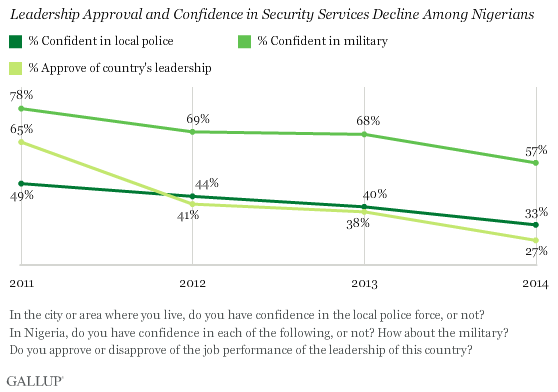 Confidence in local police has also declined and currently stands at 33%, down from 40% in 2013. The Nigerian military has not been able to hold on to large parts of the country's northeast, rendering the region essentially lawless. But allegations that the Nigerian military has engaged in retaliatory attacks, such as the one that killed 200 civilians in Baga this April, have done little to improve its image, even potentially aiding Boko Haram's recruitment efforts. It is in this context that one in four (27%) Nigerians now say they approve of their country's leadership, the lowest percentage Gallup has measured since it began measuring in 2007. The Chibok schoolgirl kidnapping drew unprecedented international attention to the threat that Boko Haram poses. Though media attention has waned in recent weeks even without the release of the girls, the kidnapping operation successfully highlighted the growing capabilities of the Islamist militant organization and the Nigerian government's perceived impotence to stop it. Nigerians lack confidence in their leadership's ability to protect them from terrorism and further high-profile attacks may only continue to erode their faith in the Nigerian government, especially attacks reaching outside of Boko Haram's main area of operations. Nigerians' views of a highly dangerous Boko Haram and a government and military unable to fight it point toward the possibility of a long insurgency in Nigeria's northeast and continued instability in Africa's most populous nation and largest economy. Results are based on approximately 1,000 face-to-face interviews each wave with adults, aged 15 and older, in Nigeria. Surveys were conducted with 1,000 respondents from July 23-Aug. 4, 2011; Feb. 15-March 7, 2012; Nov. 2-Nov.19, 2012; May 4-July 8, 2013; and May 16-June 3, 2014. For results based on the total sample of national adults, one can say with 95% confidence that the margin of sampling error is ±3.9 percentage points. The margin of error reflects the influence of data weighting. In addition to sampling error, question wording and practical difficulties in conducting surveys can introduce error or bias into the findings of public opinion polls. In sub-Saharan Africa, few residents pay attention to political events in Arab countries, but those who do view them more negatively than positively. Malians are among the most likely to hold a negative view. Although Nigeria is one of the fastest-growing economies in the world, just 9% of Nigerians work full time for an employer, and few employees are engaged at work.